“We don’t want anyone to have to wait in line,” says Matt Carey, Home Depot’s CIO. After all, the $70 billion big-box retailer doesn’t ship plywood. Or cement. An island in a sea of e-commerce, Home Depot remains largely an in-store experience. That’s why it wants to provide a good one, especially at the register. To keep egress speedy, the company has been aggressively outfitting its 2,253 stores with a quartet of checkout options. 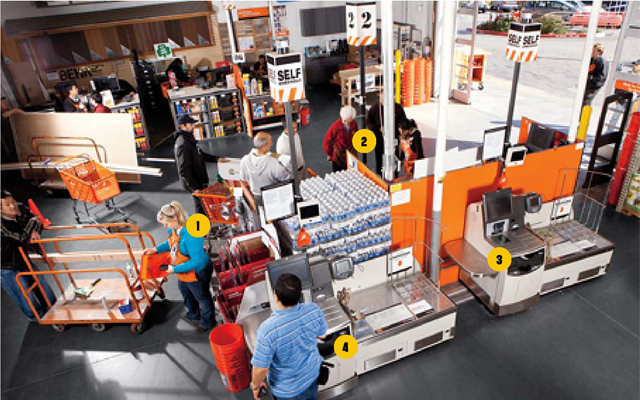 “If you don’t give customers choices,” says the National Retail Federation’s Richard Mader, one of two retail technology analysts Fast Company asked to weigh in, “they’ll go someplace that does.” Here’s how Home Depot aims to retain. Every Home Depot associate is armed with a “First phone,” a combo phone/walkie-talkie/scanner. Should the situation call for it–such as with remote garden centers, Christmas-tree lots, or during busy weekends–the unit can be outfitted with a card reader and receipt printer so it can accept credit and debit payments. Roughly 34,000 First devices will be in circulation. Not every First phone will be equipped for mobile checkout, but that doesn’t mean they can’t still contribute. When lines are long, associates can scan all the items in shoppers’ carts and hand them a card containing their purchase. All that remains is giving the card to a cashier and settling up. In January, Home Depot became the first partner for PayPal’s foray into the brick-and-mortar world. Payment terminals at registers now offer a PayPal Wallet button, which enables consumers to pay with any funding source that’s linked to their PayPal account (see sidebar). Paypal’s new wallet combines services that help shoppers and retailers alike. The quick credit source allows Wallet users to divide purchases into installments and switch payment methods after the sale. Scan a UPC code and RedLaser will recognize the product, enabling shoppers to use Milo or Where (see below) to find lower prices and special deals. Retailers input inventory details into Milo. It passes the info to anyone who fires up the Wallet. Where finds deals and coupons, stashes them, then knows when you’re at a participating retailer to apply the savings. Shoppers can pay using a phone number and PIN, with charges applied to any linked account they choose. Blowing through savings made simple.